I love reading a good series of books that I can recommend to anyone. Well, my grandparents wouldn't get this one, but just about anyone else would, especially if they like sci-fi or fantasy. I heard about Brandon Sanderson's Mistborn trilogy by chance and half expected them to be simplistic, young adult novels. A chapter or so in, I still couldn't tell what audience it was aimed at, but I could see that it wouldn't be a predictable read. After a few more chapters, I quit picking apart the dialogue and just read like the addict I was. I think I expected a stereotypical, space filler between my reading other novels. But what I got was a truly thought-out story, set in a world unlike any I'd ever read about, and going in a direction I could not guess. I actually cared about the characters and the action scenes were crazy- each one topping the last. Why did I think this was a kid's book? Am I jaded by the fact that most adult books/ movies are full of edgy content to satisfy, or define, the desires of my generation? I don't care about that stuff, I just expect it. It was so refreshing to just get a story- not one pushing the boundaries of social mores, but pushing the boundaries of my imagination. There is death, disillusionment, cruelty, and a fairly macabre storyline in there, but it is all told so well. Ever since I began the set, I've been trying to convince my kids to read it. Of course, they show little interest because of my interest. I may have won my daughter over. She was talking to a friend who's away at University who said she'd missed a class or two over this great series she was reading. Before she could say what it was, my daughter just knew it was going to be Mistborn. This series sounds just like the kind of books my daughter loves (I often like it was well, even though fantasy is not something I read often) I found the German translation (she can't read English books yet) and I will tell her about it. Thanks for the tip. I'm so glad you like it, Kara! It was such a palate cleanser for me, I feel compelled to tell everyone about it. My husband started it and is ignoring me to read, which is okay because I get it. Happy reading. Ooooo, I think I have to download this! It looks great and trust your taste in books after our mutual distain for >ahem< the Scottish book! Hmm, sounds really interesting. I've always been a big fantasty/scifi fan, but have gotten away from it lately. I'll keep an eye out for this one. Thanks for the rec! Ok I'm intrigued! It reminds me though that I have a book I need to finish before I read this one. That may be a great way to filter book recommendations, Katie. "If you like ..... then you'll hate......" Well, this one may never be your fave, but it's well thought out and, if you like fantasy, I'm sure you'll enjoy it. If that's your genre, Heather, I promise you will like this trilogy. My husband just finished the second book last night. He's hooked. These books look so good! Koen and I are planning to read them soon. I'm still busy with 'Tis, but as soon as I finish it I'll go for The Final Empire. I absolutely think you and Koen will love this series based on all I know of you :). I think I got 'Tis at a second hand store years ago, but still haven't read it or Angela's Ashes. I've heard they're both really good, too. oh! I read these and loved them. THey were a bit much for my age of kiddos, but I have since found a JF book he wrote: the Arithmatist. Its good. So glad you enjoyed them, too. I saw that Rithmatist was on sale with Kindle. Several of his books are under $5. I'm hooked. I read The Alloy of Law and it was good. 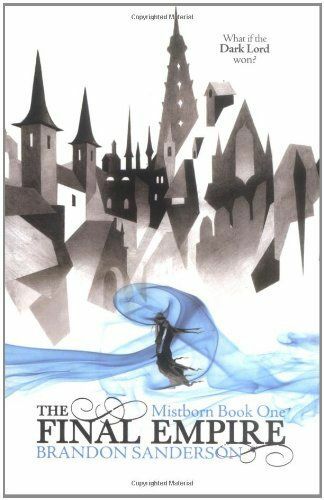 I didn't love it as much as Mistborn, but it was a spin-off. I've started. The Way of Kings and really like it so far. I pretty much love books that give me weird dreams.